(CNN) -- Three scientists won the Nobel Prize in physics on Tuesday for two breakthroughs that led to two major underpinnings of the digital age -- fiber optics and digital photography, the Royal Swedish Academy of Sciences said. 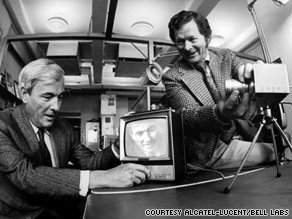 Willard Boyle, left, and George Smith handle a charge-coupled device in 1974. Charles K. Kao, a British and U.S. citizen, won for "groundbreaking achievements concerning the transmission of light in fibers for optical communication." Willard S. Boyle, a Canadian and U.S. citizen, and George E. Smith, a U.S. citizen, "invented the first successful imaging technology using a digital sensor, a CCD (Charge-Coupled Device)." Kao in 1966 "made a discovery that led to a breakthrough in fiber optics. He carefully calculated how to transmit light over long distances via optical glass fibers," the academy said in a press release. Today, "optical fibers make up the circulatory system that nourishes our communication society" and "facilitate broadband communication such as the Internet," the academy said. Boyle and Smith's Charge-Coupled Device -- invented in 1969 -- "is the digital camera's electronic eye" and paved the way for digital photography. "It revolutionized photography, as light could now be captured electronically instead of on film. The digital form facilitates the processing and distribution of these images. CCD technology is also used in many medical applications, e.g. imaging the inside of the human body, both for diagnostics and for microsurgery." The Nobel Prizes are being awarded this week and next. The medicine award was handed out on Monday. The prizes for chemistry and literature will be awarded Wednesday and Thursday. The Nobel Peace Prize winner will be named on Friday, and the award in economics will be issued on Monday.